Wow- it’s the middle of April, and we were assailed with another snowstorm! The only rational response to Thursday’s thunder blizzard was to sew a mood brightening dress in cheery Liberty print. I keep a modest amount of Liberty fabric on hand for similar emergencies. I recently purchased this happy print from The Fabric Store during their Liberty sale. I’ve made a fair amount of Liberty print button downs over the years- but an April snowstorm required a more significant floral response. This was a super quick project. I used Simplicity 8295 with minimum hacking. I added a back yoke facing- not called for in the pattern- but pretty essential in my book. I simply cut two back yoke pieces instead of one. To attach the yoke and facings, I follow excellent instructions from Grainline Studio with two options for yoke facings; the first is here and second option here. The only real change I made was to shorten the front band which originally ended at the waistline. I shortened the band to mid chest. I cut a size 6 at the top- and the shoulders were plenty roomy. I graded the waist and hips to a size 10 - all the better for biking! I also added 2 inches to the front and back hem length. Yes- that is snow behind the small green plants! The invitation called for cocktail attire! Whenever I am stumped for a fancy dress, I fall back on the most excellent Donna Karan Vogue 1809. This pattern – now sadly out of print — has been my reliable go to when I need a dress for weddings and parties. The remarkable Vogue 1809 enjoys quite a following and has been lauded by many sewists- including Sarah Gunn at Goodbye Valentino. Obviously, the dress is perfectly and simply drafted and the cut is classy. I have made it with and without the open ended darts in the front and the back. It always looks fabulous. Bonus- this Vogue dress pattern requires minimum fabric- so those spendy special occasion fabrics are an option. I found this rather special embroidered floral mesh fabric at my local fabric shop -Treadle Yard Goods. This type of fabric is pretty easy to track down and is available at several price points. I puzzled a bit over how to work the border design mesh into this dress. I landed on a simple blocked bodice design. Embroidered mesh could come across as an exclamation- and I wanted to tone it down a bit. The plain bodice is an easy pattern modification. It also was a genius comfort move- because the mesh is scratchy. The bodice was easy to draft. For the bodice and lining, I used a nice -but simple- cotton because -again- I wanted to soften the overall statement. Even if I go dressy, I like to stay grounded. I debated over the construction- because the mesh is tucked into the bodice seam, I wasn’t sure if I should line the dress or sew the mesh and lining as one piece. In the end, I cut out the embroidered mesh and the lining and sewed them as one piece. I know this seems like the easy route- but sometimes the easy path also provides the best outcome. By encasing the seams within the lining, there were no seams showing through. And the darts easily became invisible- love that. I also eliminated the front double ended-fish eye- darts, although I kept the back double ended darts for subtle shaping. Below you can see how I worked the border design from the hem- so the flowers are “growing” up from the bottom of the dress. I know I have already discussed my love of a shift dress. But, this is a recurring theme with me. I did some quick research and learned the origin of the shift dress is the 1920’s flapper dress. A shift dress falls straight from the shoulders, has a short length and the only shaping is darts around the bust-making it easier to “dance and move.” This was a dramatic departure from the corseted styles that preceded it. The shift dress was revived in a big way in the 1960s. You can find plenty of shift dress warnings: Avoid looking like a paper bag! Don’t go too loose or too tight! Don’t be boring! But, I say- no need for caution! The shift dress is super versatile and is still the perfect wardrobe choice for a modern lifestyle. I also favor this as a simple one and done wardrobe choice. 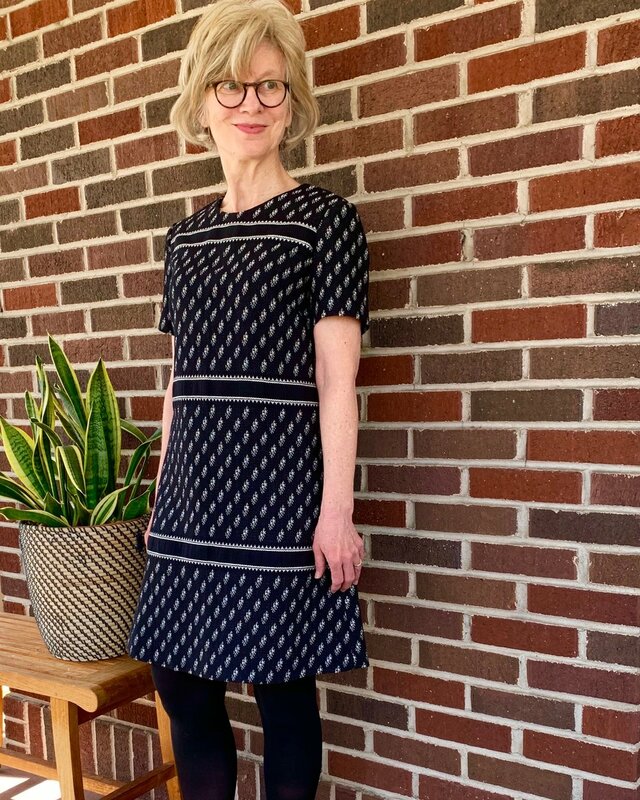 For this shift dress- the fabric does all of the heavy work. This beautiful cotton woven with a repeating zig zag border makes this simple, straight-forward dress memorable. 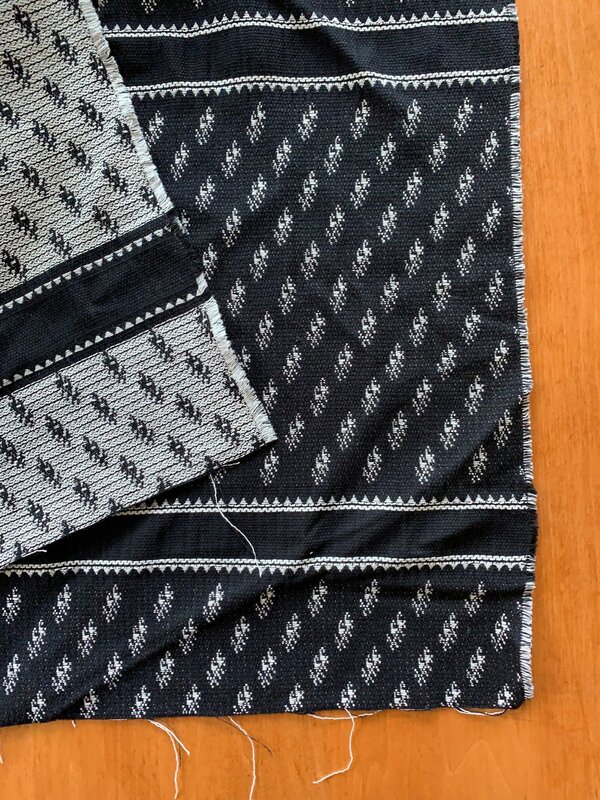 Note the pattern is woven in- not printed- which gives the fabric extra soul. The fabric is not tightly woven- but this also lends to the craft-like feel. As I discussed previously, I favor a slight A-line shape and this dress is a true shift falling from the shoulders with bust darts. The only real work for this project was in the layout. Pattern placement took some forethought to ensure the horizontal border placement was optimal. It took a bit of draping, and head scratching, but I think it worked out. 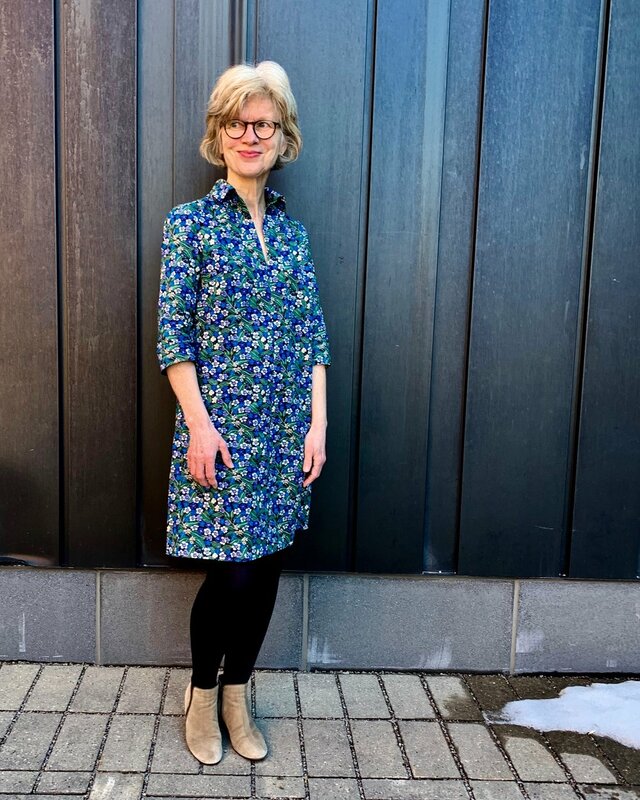 For this shift dress I used my tried and true Simplicity Cynthia Rowley 2584 pattern-now discontinued and modified the neckline and the sleeves. It might seem like trouble to fiddle with those details- but I know the overall cut and shape are right- which makes minor details easy to sub out. Once the pattern was placed and cut out- it was such a quick and satisfying make. Whenever we take a trip, I almost always sew something new. Travel typically means a different climate and always means non-work wear clothes. So, I consistently seem to need something to fill a gap in my existing wardrobe. That said, and as much as I have a closet full of clothes- I am truly a light packer. For trips that last 5 days or less, I often just take a regular backpack. For trips up to 10 days, I use my larger 55 liter backpack. When we return home from an overseas trip- customs agents almost always ask me where my luggage is. Ha! We recently had a very spontaneous opportunity to take a quick warm weather break. 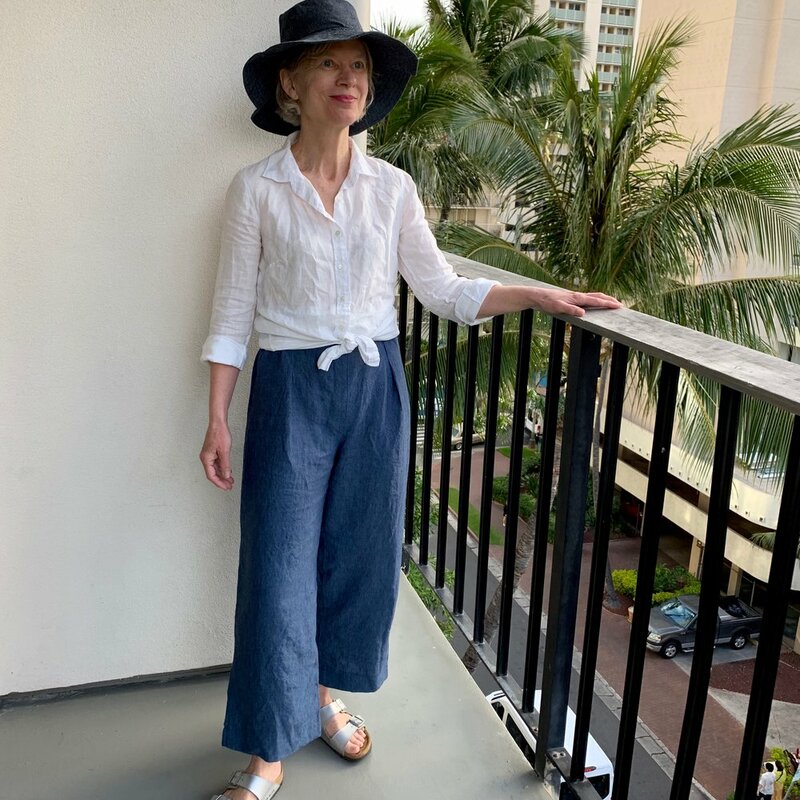 I wanted/needed some light linen pants that would do double or even triple duty and be great for the beach and for sight-seeing and would provide winter white leg coverage and sun protection. Important! I had two days to get this done, I used the Style Arc Tully pattern that I owned – having made these up previously for my daughter. I wanted simple elastic pants, and I appreciate the flat front and paper-bag waist features of the Tully. I found the perfect blue linen fabric from my local and fabulous fabric store: Treadle Yard Goods. 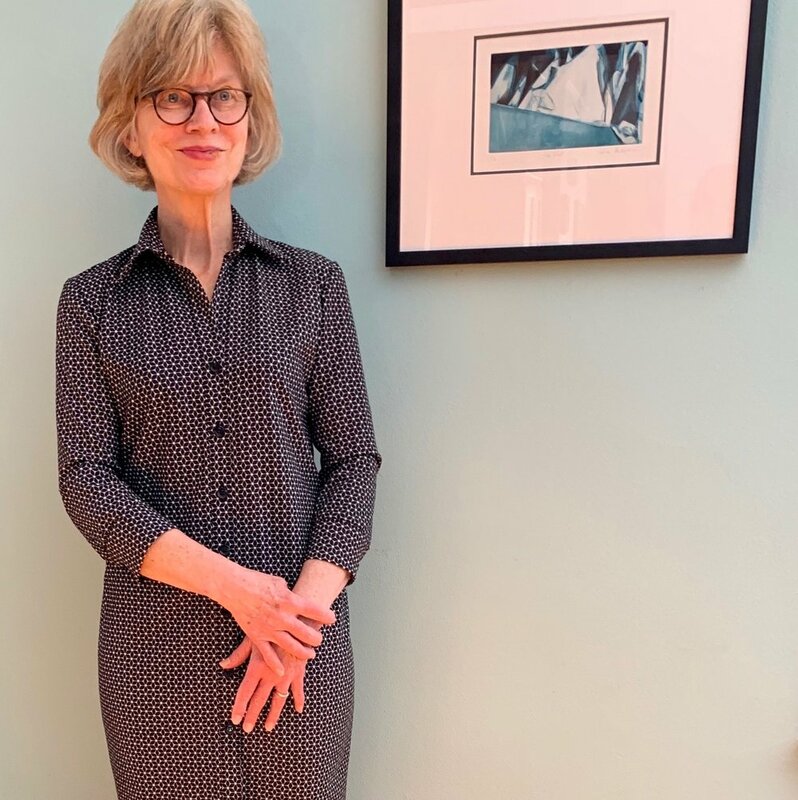 Nicely pressed pants pictured above in my dining room and below while on delightfully warm holiday, all rumpled and beach ready. And yet another shot back home on the porch. Note, I modified the Tully because I wanted a loose wide leg. This was simple to draft from the Tully. I simply drew a wider leg- following the grain line marking on the pattern- see second shot below. And, in conclusion, a short story about the face hiding handmade hat. This hat is self-drafted- I copied an REI brand hat that I have had forever with a perfect not too big, not too small, just right brim. I used buckram inside the brim – but next time, I will use another layer -or find something even sturdier- for more stiffness. All the better to see! I stumbled across this Vogue 7415 shirt dress pattern in my collection recently that is quite possibly from the 1990’s -well, maybe not that old. I was drawn to this pattern again; the slightly larger collar and broader shoulder looked appealing and fresh. I have been making and wearing shirt dresses forever. A shirt dress is polished for work but laid back for weekend, social and travel wear. A shirt dress is almost always appropriate. Besides it’s versatility- a shirt dress is an enduring style in any iteration. You can fiddle with collar size, sleeves, fitted or oversized silhouette, straight or flared skirt, etc. Whatever spin on the shirt dress you choose, you will always look smart. That’s why I am committed long term to the shirt dress. Why hadn’t I made this pattern up previously? It is a “stretch knits only” pattern, and that may have been a stumbling block previously. But today, there are so many choices for knit. I used a perfect stretch fabric from emma one sock- seriously the best. It is lightweight and even though it is stretchy it is super stable with great recovery. The project was super quick- there are only a few pattern pieces. I could have been done in a few hours if not for my mix-up with the sleeve placket. The actual sewing of the placket was easy and successful….EXCEPT- I put them in backwards. So, I had to do some seam ripping. I seem to be refining my unpicking skills these days more than my sewing tricks. I believe when I was younger, I would have settled for backwards cuffs- but now I have the patience and perspective to take another minute and get it right. See- the plackets are in correctly now and perfectly functional and lovely. I feel very laid back and at ease in this comfortable dress. But, it is also very boss looking- probably should be leaning in to the work week. This pattern has a great cut and fit. And with a multitude of knit fabrics to choose from, I intend to makes this again. I have no doubt this will be a wardrobe mainstay with the winning combination of polish and comfort.